← Flying and Still Loving It! The ABBA classic of almost the same name is timeless and fun. Today was however not about music, but about flying a timeless and fun plane, a Mooney M20J. The Mooney is rather timeless, it hasn’t really change much since the early versions and even the latest and greatest are still have that very distinctive look. Ever since BigKev had taken me out formation flying in the Mooney, I’ve have the desire to get in and learn to fly it myself. Today that day came! At the start of the Easter break, I’d set myself the goal of getting type rated in the Mooney. Just had to fit it around a week away in Dunsborough, a bunch of fishing, some wake boarding and then learning to move again with post wake board muscle piss-weakness. Anyway I’d been looking forward to this opportunity for some 3 years, finally seeing what the mystic and scary stories were all about. Having arrived home from holiday, unpacking and grabbing a beer, it was finally time to get out the Mooney Pilot Operating Handbook and studying the some 176 pages along with the other 3 attachments I’d been emailed. With the engineering & performance questionarre at hand, it made for a good 4 hours of study. If the Mooney was half as good as the performance numbers, it would be awesome to fly! Checking out a few vids on Youtube to break up the reading, just got me more excited. There is such a huge and dedicated following of Mooney fans who seem to post a great number of videos, which was excellent! A few things that were interesting about what I found on the Mooney online, is that they have a bit of a reputation as being difficult to land, particularly if your speeds are not on the money. Reading the Mooney Safety Program handbook talks of the Mooney Trilogy. It starts with a bounce, followed by application of engine power to go around, not enough right rudder and the aircraft heads left to the scene of the accident. At least reading all of these things has me in the frame of mind, if the approach is not spot on, go around. Oh and have a pile of right boot ready for the rudder. I arrived a little early to Jandakot for the first check flight, that way I’d have time to go and have a look over the aircraft. Try and get at least a little familiar with the cockpit layout. The dash was 1970’s finest, VH-AKF is a 1978 model and it looked it. Everything needed was there though, even the oldest looking radio and autopilot I’ve ever seen. Running up and safety checks were just like being back in the Cardinal and Diamond, with the CSU checks added to the checklist. The Mooney is quite a sweet sounding machine too, I was super excited and ready to roll. It was at this exact moment that the worst radio broadcast you can hear as you are readying to take-off. “Jandakot Terminal Information India, Expect Instrument Approach, Runways are wet…”. Looking out the window they weren’t wet yet, but the heavy rain cloud was about to change that. Ben and I looked at the weather radar and felt it was just a shower and no too much behind it. So we made the call to go. “Jandakot Tower Mooney Alpha Kilo Foxtel Ready 06 Left for Yangebup departure”. The tower asked if we had information India which we confirmed and with that you could almost hear them, “Ok crazy people, Clear for takeoff”. The takeoff roll was not disimilar to other CSUs, a little more right pedal and she climbed easily. At about 100 feet you could see why the runways were about to be wet, the windscreen started taking rain drops. The tower gave us an unusual right turn into the circuits runway as we departed to the south. What a great little machine! Turning downwind at the top of our climb, the Mooney quickly picked up a pile of speed and was already punching past 120 knots. Time to wind it back a little from climb settings and get a hang of this thing. We headed out to the south of Cockburn Sound ready to go through the aircraft handling exercises. Stalls, turns, rapid descents, manual gear drops and of course a PFL. I was expecting the Mooney to sink like a brick, but to my surprise it was not bad. That was of course until we dropped the gear. 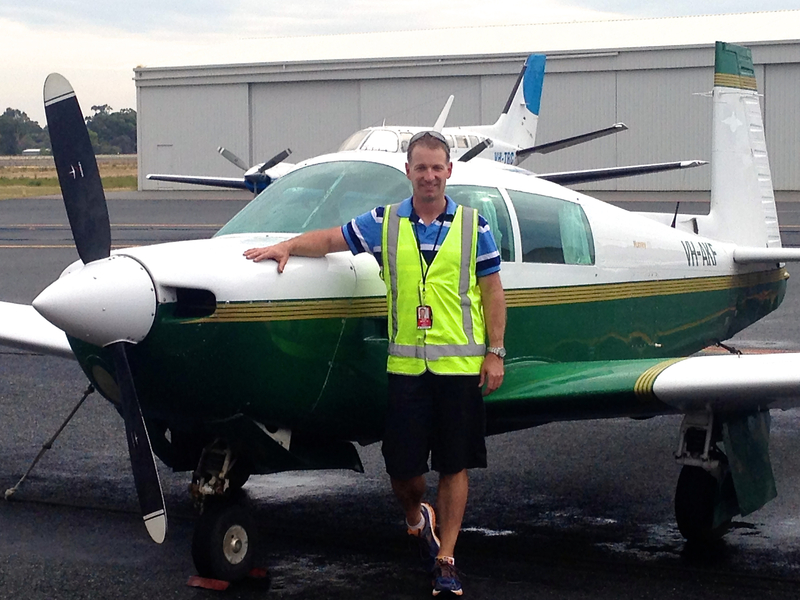 Ben was happy with my handling results, so we headed back to Jandakot. Luckily the weather had passed and was hanging to the east of the field. We got clearance in and headed for the circuits runway. I was getting that awesome excitement building again, I was hanging to see how much of a handful the Mooney was for landing. The first touch and go was not bad, the yoke is pretty heavy, but the Cardinal was not really any lighter. I managed to hold the nose wheel off a little longer than I’d expected. With a an adjustment to flaps and bit of a squirm on the wet runway, we were back airborne again. Circuit after circuit we racked up around 7 landings. We did 3 glides (with and without gear) and made it in each time. The gear down glide was interesting, it reminds you to fly your circuits tight, you don’t want to be too far away. It made for a tight base to final turn no more than 100 feet off the deck, but it was one of the smoothest landings of the set. Sweet, I love this thing. I’d have stayed all arvo, but Ben said I’d done enough to convince him we were done. While tying down the plane, the big smiling face of BigKev came out to say g’day. He’d come down to see how I’d gone and welcome me to the world of Mooney’s. Was awesome and was great to share the moment with a friend who’s helped feed my excitement for flying! Back inside, Ben said I wouldn’t need any further prep with him, he’d give me the ok to now fly with a Grade 1 instructor for final sign off (insurance requirement at RACWA). However he also broke the news a multi choice exam would also be required before the final check flight. Yeha, not! Back the next morning and another review of the POH, the flight liason officer handed me the test. 44 questions and a good hour later, it was finally done with a pass. So roll on next Saturday, Grade 1 review here we come 🙂 Can’t wait to fly the Mooney again!